The anticipated debut of the country music legend’s weed brand — which includes cannabis flower grown by established license holders in each state — will coincide with Nelson’s previously scheduled tour stops at Marymoor Park in Redmond, Washington, on July 23 and Fiddler’s Green Amphitheatre in Greenwood Village, Colorado, on July 30. The initial list of retail stores that will carry Willie’s Reserve products in Colorado include Lucy Sky Dispensary, Mindful, Simply Pure and Terrapin Care Station; The brand’s Washington state retailers include Buddy’s of Renton, the Evergreen Market, Fweedom, Greenside Recreational, Gypsy Greens, Herbn Elements and Nimbin Pot Shop. Even though the brand’s marketing materials playfully say they’re opening up access to the singer’s “legendary stash,” the Farm Aid co-founder and his Willie’s Reserve team aren’t growing the marijuana themselves. Because cannabis is a federally controlled substance, the commercial cultivation and sale of marijuana is strictly governed by the four states offering recreational sales and the 25 states that have legalized medical pot. Like other celebrity cannabis brands, including Snoop Dogg’s Leafs by Snoop line, Willie’s Reserve is partnering with existing, licensed marijuana growers in each state — but “Nelson has consulted with horticulturalists and cannabis farmers to assure any product labeled Willie’s Reserve will maintain a standard worthy of his name,” according to press materials. The subject of a recent New York magazine cover story titled “Big Pothead Versus Big Pot,” Nelson also hopes cannabis legalization continues to right Drug War wrongs and spur ethical cultivation practices and standards. 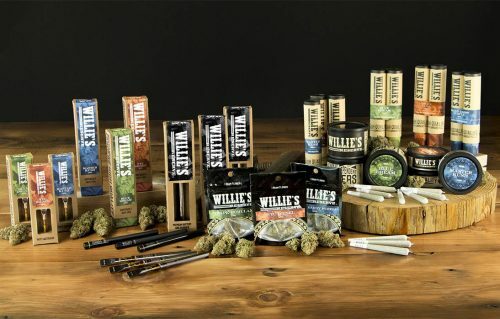 The Willie’s Reserve product line will include pre-packaged marijuana flower sold in gram pouches, along with eighth- and quarter-ounce nitrogen-sealed cans, and pre-rolled joints sized at a half-gram or one gram. The company will also sell its CO2-extracted cannabis oils in disposable vape pens and universal-sized vape pen cartridges.